The question when the first april fool was played remains unsolved. Some say it goes back to the romans who celebrated carnival, other say it is a relic from the 16th century when they changed the calendar so that the first of january is the new years day instead of the first of april. People keep on giving presents and making good wishes have become april fools. The tradition of making april fools is centred around Europe and the United States of America. For Example in France april fools are also known as “poissons d’avril” or “april fish”. In Great Britain you are a real fool if you keep on playing after noon, in Scotland they attach paper sign on someone’s back and in Poland people dress up with costumes. Sounds like adults playing childs and having the permission to do stupid stuff. I actually was thinking about posting that there would be no class next week but looking objective, this would cause more than just a bit of trouble and laughter. It would flood students coordinators mail boxes and give absent students a good excuse. That would definitely cross the border of an april fool. Does it? The Sunday and Monday prior to Lent is when the Portuguese celebrate April Fools’, and they have embraced one prank as their own: throwing flour on someone. India’s Holi festival is celebrated on March 31, and is a day to play jokes, toss colored dust and wear face and body paint to inaugurate spring. In Denmark May 1 is Maj-kat a joke day, although here and in Sweden they also celebrate April 1 as April Fools’ Day. Perhaps at the end of a long winter, Scandinavians are doubly ready to let loose and herald spring. Actually the last suggestions matches with the Finnish “Vappu” day when students start celebrating the beginning of summer. On the other hand Vappu matches with another European tradition, the Walpurgis Night. The Finnish april fool traditions originally involved sending a rotten fish to someone but in the last years also broadcasters hosted pranks. So do not let anybody fool you today. 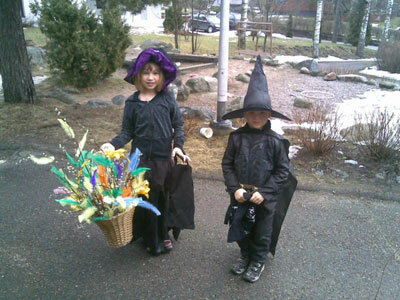 Finnish children go around as witches and wizards to give best wishes to the households that give them sweets. Next Post Find the easter eggs!